Our last day in Spain, and so our last chance to visit the good birding site that was literally just round the corner from our apartment. 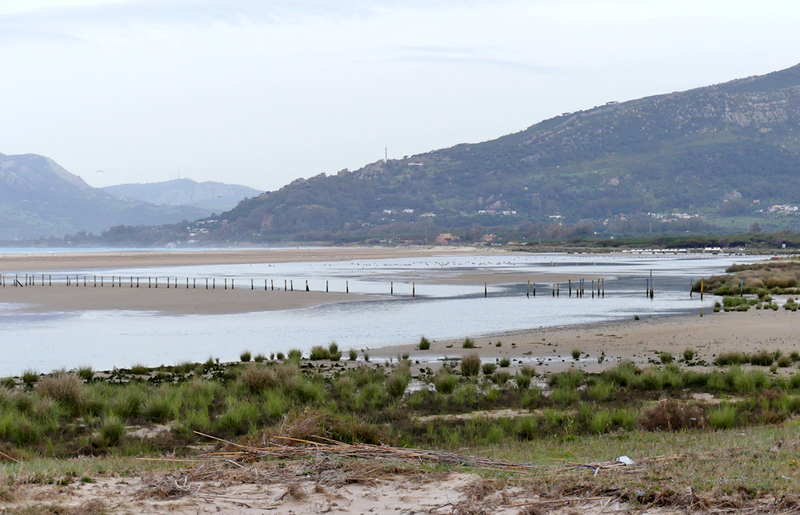 Los Lances beach is a large area of sand which gets covered in windsurfers and paragliders during the daytime and so it's important to get there early before the roosting birds have been frightened away. We got up nice and early and took the boardwalk from the western edge of town across the flat dunes in the cloudy and breezy conditions. The flat grassy areas either side of the path before we reached the main beach area were very good for birds, the best being the ten or so Short-toed Larks which apparently breed commonly here. Other species which were along here were a couple of Wheatears, a White Wagtail, a Meadow Pipit and many Crested Larks. Before we reached the end of the boardwalk, Ian picked up a couple of Audouin's Gulls fly south down the beach, a species we'd hoped to see here. We thought that we might see a few more when we got to the hide overlooking the inlet but unfortunately everything was very distant from here, more distant than we thought. We did see a few more Audouin's sat up on the sand over the far side but it was difficult to get any detail on them. There was a decent flock of gulls on the water including some Mediterranean Gulls with them. A good selection of waders was present here including Sanderlings, Kentish Plovers and the first Grey Plovers of the trip. We didn't stay too long here and we had a Nightingale singing in a garden on the edge of town as we made our way back to the apartment. We weren't too sure about what to plan for birding today, but I knew that I definitely wanted to visit Gibraltar since I was so close, so we had to head East. Looking on eBird, we noted a cluster of Rock Sparrow sightings, including recent ones, in a hillside town called Casares, which wasn't too far north of Gibraltar. Since this was the most likely new tick for me we thought it was worth the drive there and it would hopefully take us away from the murky weather coming in off the Atlantic. Turning off the motorway we passed some low-flying Griffon Vultures and we had a Peregrine go over, and then a Woodchat Shrike along the side road. 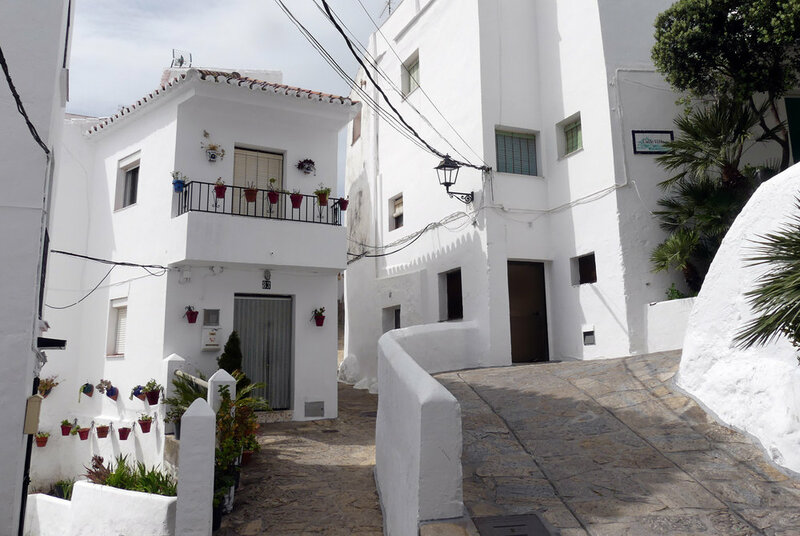 We didn't know what Casares was like at all, but as we turned the corner and saw the town we were met with a pretty impressive sight. A tangle of red-roofed, whitewashed houses clinging to the edge of a steep saddle between two hills. We followed the sat-navs directions towards where most of the red spots were on the map and the computer took us right through the middle of town, through tiny cobbled streets barely wide enough for our vehicle. We eventually made it through to the other side and we parked up and wandered down a track with suitable rocky habitat. Unfortunately, after a while of searching here there was no sign of any Rock Sparrows. It was a nice area though, with Blue Rock Thrush sighted as well as Serin, Crag Martins, a close Griffon Vulture every now and then, plus Ian saw a Cirl Bunting. We thought the Rock Sparrows may be up at the Castillo, the very highest point of the town, so we walked through the narrow, labyrinthine streets of this lovely little place. It can be a shame when on a pure birding trip that you spend so much time racing between different birding sites and focussing on seeing lots of different species, that you sometimes don't really take in the other aspects of a country or region. You get to see plenty of the spectacular countryside but built up areas or touristy spots, rarely get a look in as they are usually overrun with persons. So, I really enjoyed our wander round Casares even though it wasn't really birding and we dipped big style. Looking out over the town, the busy square at lunchtime, the randomly placed whitewashed houses almost stuck to the rock, the ruins of the Castillo and especially the town's cemetery. This was right on the edge of the cliffs - hence why we wandered in there whilst searching for birds - and was densely-packed with white-painted tombs, stacked on top of each other along either side of narrow paths. As it was just after Easter time, each one was still resplendent with brightly-coloured flowers. I have rarely seen such a beautiful place. However, as nice as it was we struggled to find many birds. We did think that the two Kestrels that regularly appeared circling over the town we Lesser Kestrels. After our fruitless search for the Rock Sparrows - quickly becoming my nemesis bird - we returned to the west side of town and pulled into a parking area which had a lookout and also looked good for 'craggy' species. 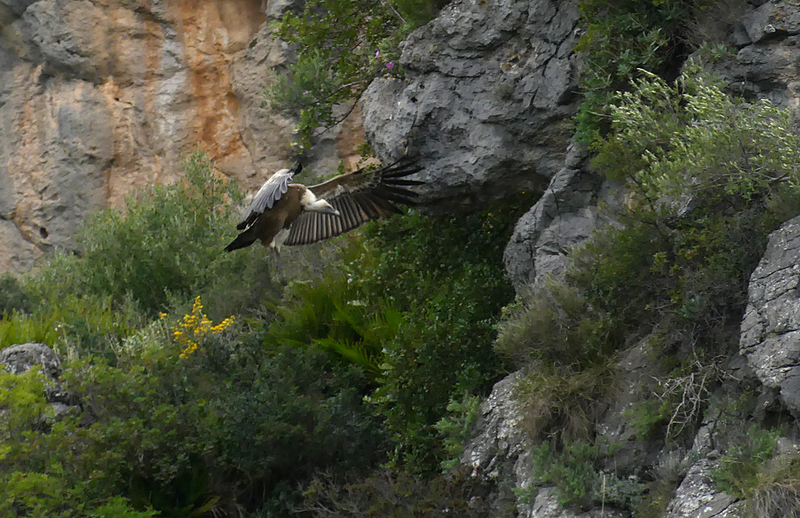 This was an excellent raptor viewpoint and the local population of Griffon Vultures often soared right past us at eye level. We quickly noticed some migration going on and we saw about 10 Booted Eagles, 3 Short-toed Eagles, a Marsh Harrier, 3 White Storks and quite a few Black Kites, all passing the hillside in a northerly direction. Bee-eaters were also moving through and we must have had at least 200 birds during the next hour or so. Whilst here, the exertions of the previous few days suddenly hit us. When we were young, full days of constant, dawn 'til dusk birding didn't bother us at all. But clearly we're getting a little a bit older and we hit the wall, especially Ian who was doing all the driving. So he went for a kip in the car whilst I sat on the grass overlooking the valley and continued to watch for raptors. It must have gone round on the local Griffon grapevine that there was a carcase in the vicinity because suddenly there were vultures all around me. There must have been at least 40 birds drop down low into the valley below me giving excellent views. There were a few other birds around this watchpoint with Sardinian Warbler and a female Cirl Bunting perched in the gorse below. Scanning the crags for birds revealed a Blue Rock Thrush, as usual, right at the top of the cliff, and a couple of Choughs sailed by. After we'd had a rest, we set off south again and headed for Gibraltar. It was nice and straightforward getting into Gibraltar with no delays at all. So we passed the checkpoints, drove across the airport runway and into the busy town. It was now the middle of the afternoon and there were lots of people around the streets. We attempted to navigate around but it was very difficult trying to find where the bird guide book suggested to go, but we ended up finding a narrow road leading higher up the rock. We arrived at where we thought we were going to park as there were lots of other cars there, but we were met by a very grumpy woman who basically told us to sod off as we were not supposed to be there! We tried explaining that we'd just driven up the road and we wanted to know where to park, and she just got very stressy with us and told us to drive right back down the bottom again and not return. Very helpful Gibraltar, well done. But we had little choice about it and drove down to the bottom again. 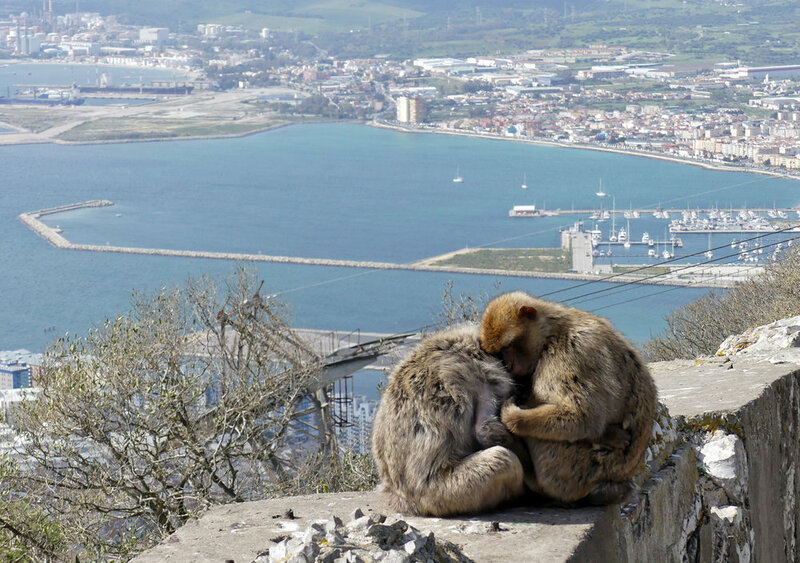 As we skirted the southern tip of Gibraltar, we looked up and saw two or three Barbary Macaques trotting along the wall high above us - at least we'd seen the monkeys. We found a large car park by the southern lighthouse and got out. We looked up and wondered how we were going to get up there to look for Barbary Partridges which would be a new species for me. We knew we could take the cablecar to the very top but the guide suggested that the partridges were mainly further down the slopes. We read the guide again and there was a path marked on the map where it said you could walk up to where the partridges like to hang out. So we headed round the corner and walked along the main road towards the chapel where the path headed inland. As we passed a flowerbed outside some houses, a superb Swallowtail was feeding on nectar right in front of us! Buoyed by this cracker of a butterfly, and also by the small groups of Black Kites that were appearing in the sky above us, we pushed on to the track by the chapel, only to be shocked to see a locked gate in front of us! And as if to rub a pound of salt into our wounds, there was a painting of a Barbary Partridge on the gate!! They had obviously shut off this area to give the partridges some protection - it's almost as if they didn't care about my list. We had little choice but to head back to the car for a rethink. 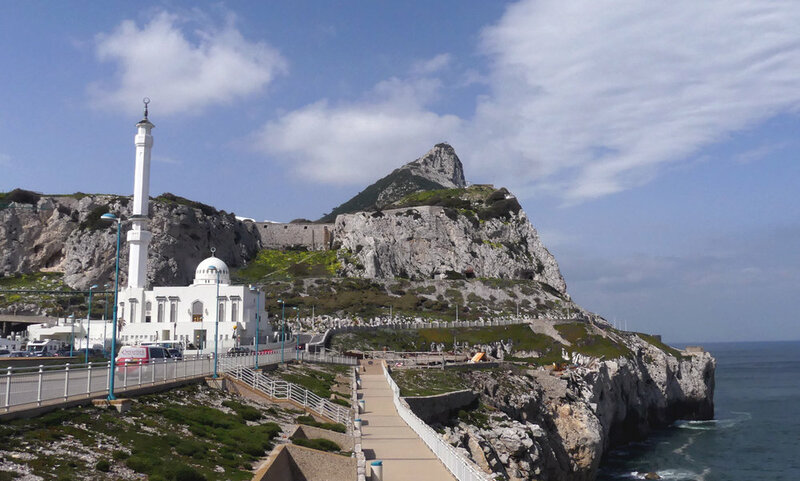 As we made our way back past the Mosque, I stopped briefly to take a look at it and also gaze back at the rocks above, when I suddenly saw three tiny dots whizz across a gap in between the crumbling walls against the skyline. It took me a second or two but then I realised what they reminded me of. Their very direct flight and almost spherical shape with no wings visible recalled a typical view of Red-legged Partridges skipping over a hedge or something. However, as the view was distant, lasted a fraction of a second and without bins, I couldn't even be slightly sure of what I saw - perhaps some doves or pigeons zipped by. In any case, it seemed unlikely that I'd ever see them again as they disappeared behind the walls into the out-of-sight scrubby area. I gave it a minute or so and was going to head off again when suddenly, out of nowhere, a BARBARY PARTRIDGE popped up and just stood there, bold as you like, on top of the wall! I shouted Ian back and we stood there gobsmacked that we'd been so lucky. 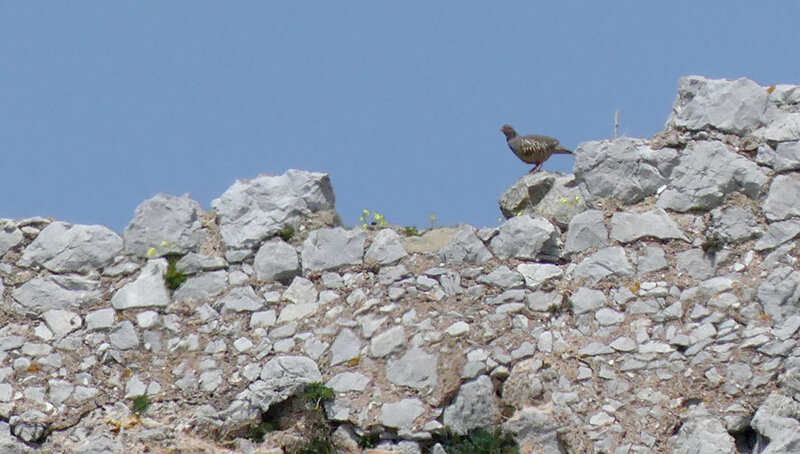 The species is meant to be skulking and difficult to find on the scrubby Gibraltarian slopes and we see one from the main road, stood up on a wall almost waving at us! Barbary Partridge is not thought to be originally native to Gibraltar but has been there for a very long time, at its only station in mainland Europe. We could not believe how jammy we had been. Perhaps, as we were standing in the shadow of the Mosque we had some kind of divine help. 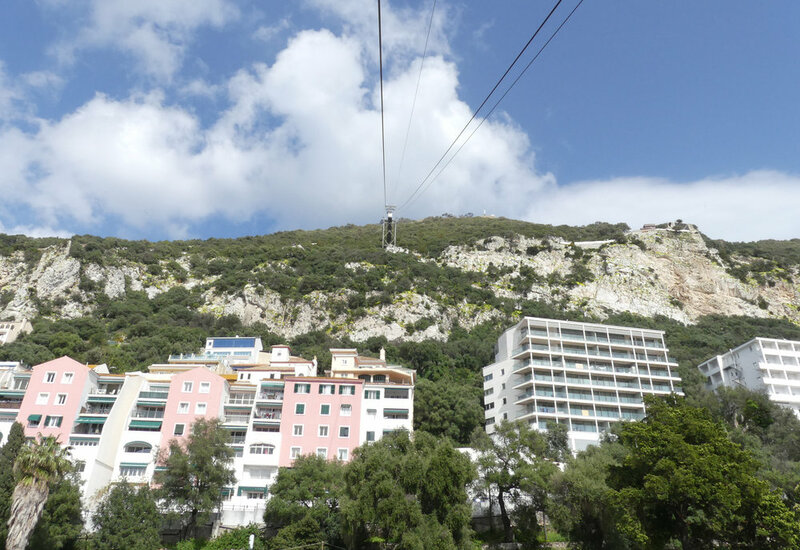 I didn't really want to leave Gibraltar without climbing up the Rock as I might never return here, so we decided to take the cable car. I am not very good with heights and so I was a little concerned, but I needn't have been because it was a smooth and spectacular. 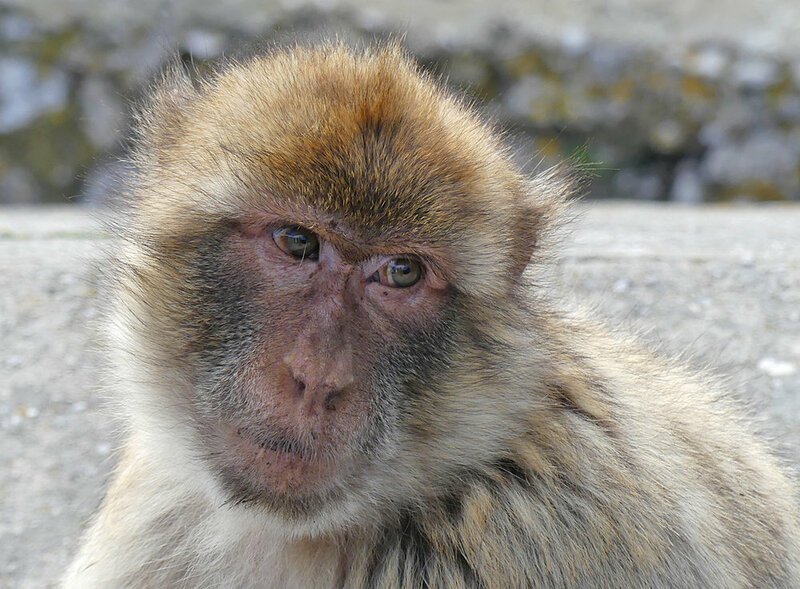 We had an enjoyable time up at the top of the rock and I was very impressed by the macaques or monkeys, loafing around like little, hairy humans. Although, like the partridges, these are probably not native, they have been on the Rock for hundreds of years and are actually the first primates that I have seen out in the wild. They were very photogenic, I loved their facial expressions. The one which ran into the café and nicked some leftovers was literally a cheeky monkey! We didn't see a great deal of other things up at the top but a Spanish Festoon gave us a merry chase, a new species of butterfly for us. We didn't see any land migrants but a couple of Booted Eagles were seen as well as the kites, and two Sparrowhawks came by. I managed to drag myself to the edge to look down the cliff on the eastern face of the rock where a Yellow-legged Gull colony was situated. We didn't stay too long and we came down the cable car again and drove out of the territory back to Tarifa for the last time. Copris hispanus (or similar species), Tarifa, attracted to the streetlights. 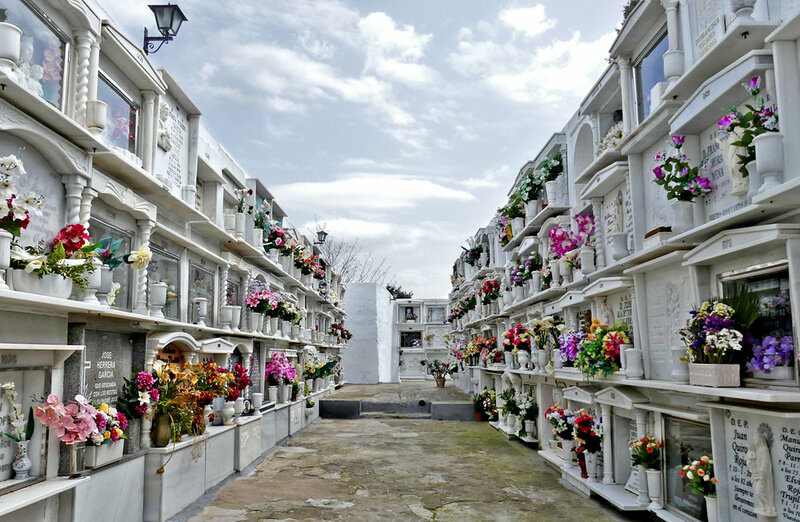 The next day was my flight home and so we had to get up early and drive to Malaga. The journey went smoothly and as we approached Malaga Airport we started seeing some MONK PARAKEETS from the car flying alongside the motorway. Although not exactly exciting, these feral birds are now common in various places in Spain and were officially my final tick of the trip. We knew there were Monk Parakeets in Malaga but we hadn't planned to search for them at all. Ian dropped me off at the airport - he was staying another week with his family - and my flights again went smoothly and I arrived back in Guernsey in the evening. So another BUBO trip had come to an end and we were pleased with what we had seen in the four and a half days we had in Andalucia. We totalled up and reckoned we saw 152 species. Personally, I had 7 new birds to add to my life list. Two of these were proper native species - Black Wheatear and Thekla Lark - one was an almost-native species - Barbary Partridge - two were rarities - Lesser Flamingo and Common Bulbul - and two were feral exotics - Common Waxbill and Monk Parakeet. So quite a mixed bag. But it was more the excellent views of rare species or ones I hadn't seen for many years, as well as the fabulous migration spectacles, which were the most memorable highlights of the trip.